Next Level Grilling Tools | Valet. 7 tools that will make grilling easier and your food tastier. Summertime and grilling go hand in hand. After all, what's a beautiful, sunny day without a beer and some barbecue to enjoy outside? And grilling is simple—literally holding food over a fire. That's not something you want to overcomplicate with too many gadgets or tech-y gimmicks. But a few well-chosen tools can sometimes make the process easier and the food more enjoyable. Here are seven well-chosen options to consider if you're looking to expand your grilling gear beyond the usual BBQ basics. Pulled pork is the holy grail of Carolina barbecue, and those talented pit masters who make it for a living have developed "asbestos hands" for shredding the meat by hand (only wearing a pair of simple rubber gloves for protection). 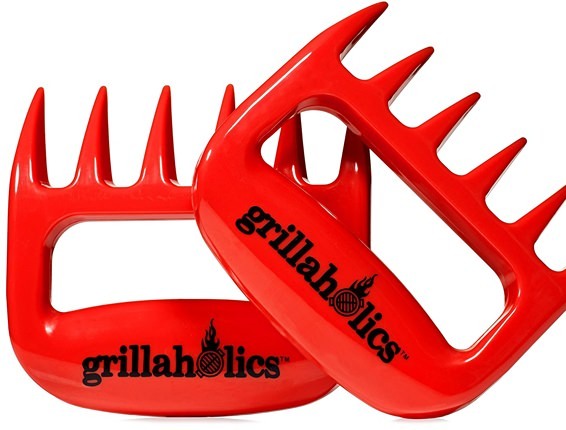 For the rest of us, some meat claws will help you shred the meat without burning your fingers. And the sharp prongs also help you lift meat and hot foods, toss salads or hold food for slicing. 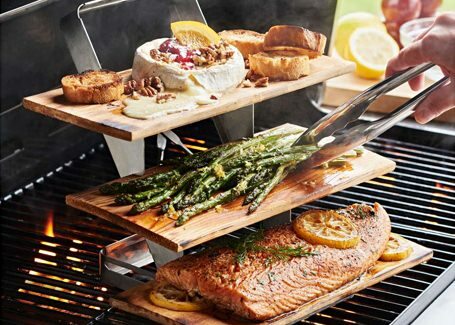 The three-tiered design of this wood plank griller means you can cook multiple dishes at once while saving space on your grill. Stack your meat and vegetables on the various wood planks—cedar for salmon, maple for your vegetables—and let them infuse the food with delectable moisture and flavor. When ready to serve, the collapsable and dishwasher safe rack also makes for an impressive presentation on the table. Everyone likes shish kabob skewers. And you think they'll be easy to throw on the grill until your meat and vegetables start rotating (making flipping near impossible) or slipping off the skewer (dropping your food into the fire). 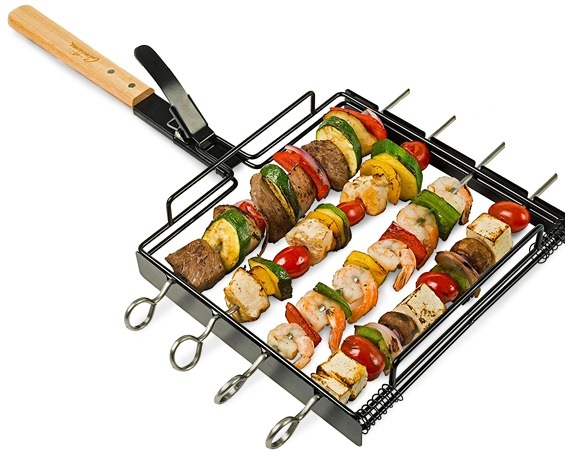 This clever set features non-stick stainless steel skewers that lock into a rack with a detachable handle. Easily place your rack on the grill, flip for even cooking, then safely remove it for serving. There are all kinds of tools and gadgets (and even robots) that promise to make quick work out of a dirty grill. But this one's the simplest, safest and most effective. The Great Scrape's Woody Paddle is just that: a wooden paddle. The trick is to first use it on high heat, burning grooves into the wood that match your grill. 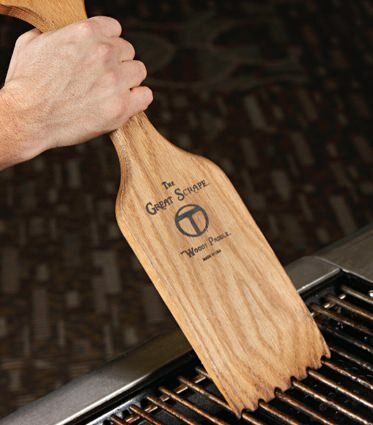 Now you've got a custom scraper perfectly tailored to your grill's grates. And bonus, no wire bristles will be left behind after cleaning. 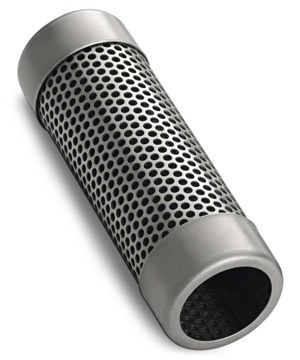 Turn your standard grill into a smoker with this small metal tube. You fill it with tiny wood pellets (in a range of woods, from mesquite and hickory to our go-to favorite, apple wood), place it on the side of your grill's grate and let it impart your foods with a rich, smokey flavor while you grill. Or use it as a cold smoker to smoke nuts and cheese. There's only one reliable way to tell when a large hunk of meat is properly cooked, and that's to check its internal temperature using an instant-read thermometer. 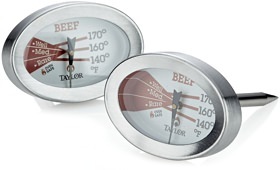 These handy thermometers stick into a steak or another piece of beef and can be left in during cooking, ensuring everyone gets the doneness that they requested. And you're never apologizing for over- or under-cooking someone's meal. A charcoal grill offers unbeatable flavors. But waiting for the coals to be ready can often feel like an eternity. 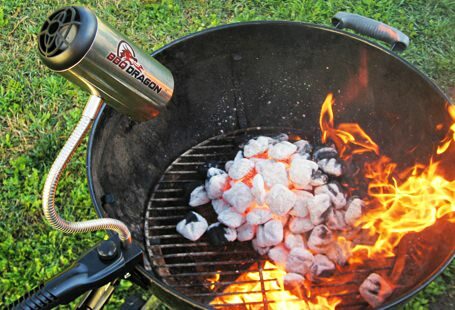 This adjustable, high-powered cooling fan attaches to your grill and can light a charcoal barbecue in under 10 minutes. It recharges via USB port, meaning you can use the household chargers you already own. And it works just as well getting a flame going in your fire pit or fireplace too. Smithsonian magazine examines how America's meaty tradition grew from Caribbean roots to the four distinct styles we know today. The biggest barbecue blunders and how to fix them. 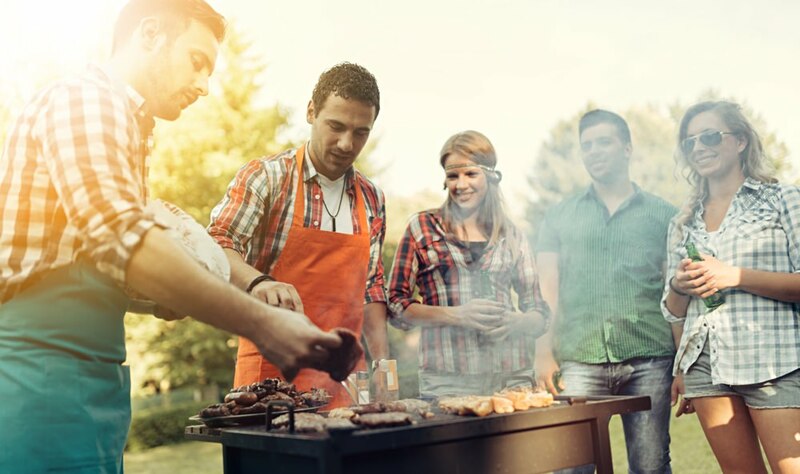 A few simple steps to keep in mind that will keep your barbecue in top condition.